Sunshine and clouds mixed. Warmer. High 76F. 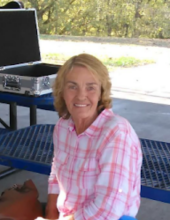 Winds light and variable..
Norma J Miller, age 78, of Jackson, Kentucky, departed this life to be with the Lord, surrounded by her loving family Monday, April 08, 2019 at Greg & Noreen Hospice Care Center in Hazard, Kentucky. Norma was born on April 09, 1940 to the late Aldo Miller and Evy Fugate Miller. She is survived by three daughters: Anna (Buck) Gross of Campton, Kentucky; Lisa (Robert) Miller of Richmond, Kentucky; and Jeanie Noble (Eric Combs) of Rogers, Kentucky; two sons: Albert (Crystal) Martinez of Jackson, Kentucky and Arthur Noble Jr. of Jackson, Kentucky; two special friends: Khristie Roberts and Ollie Bates; one step-brother: Wade Neace of Lost Creek, Kentucky; special granddaughters: Stephanie Martinez (Steve Sandlin) and Rachel Miller; special great grandson: Corey Flinchum; grandchildren: Donald, Bryant, Kaitlin, Alexis, Harley, Jordan T, Hunter, Austin, Trey, J.J, Dawnovan, Braxton, Jordan B, Hailey, and Paul David; special great grandson D.J., great grandchildren: Bryant Jr., Gabriel, Brentley, Payzlee, Presley, Alex, Emma, and Addy; and a host of other loving relatives and friends. In addition to her parents Aldo and Evy Fugate Miller; Norma was preceded in death by her step-mother: Eurbane Miller; a great granddaughter: Haley Michelle Martinez Elam; and three brothers: Lileo Miller, Shirl Miller, and Albert Miller. Funeral services were conducted at the Watts Funeral Home Chapel in Jackson, Kentucky at 2 p.m. on Thursday, April 11, 2019 with Mike Tabor officiating. Friends visited the funeral home at 6 p.m. on Wednesday, April 10, 2019 with special singing at 7 p.m. Watts Funeral Home in charge of arrangements.